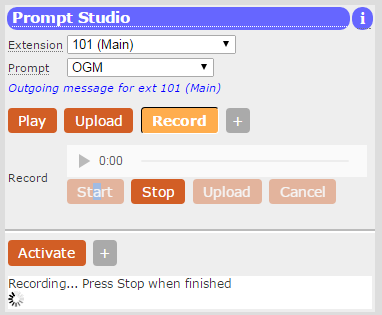 The Prompt Studio is where you can manage the audio prompts played to your callers. This includes all menus, introductions and outgoing messages. In order to present a professional image, we recommend that you record these - using someone with a good voice. 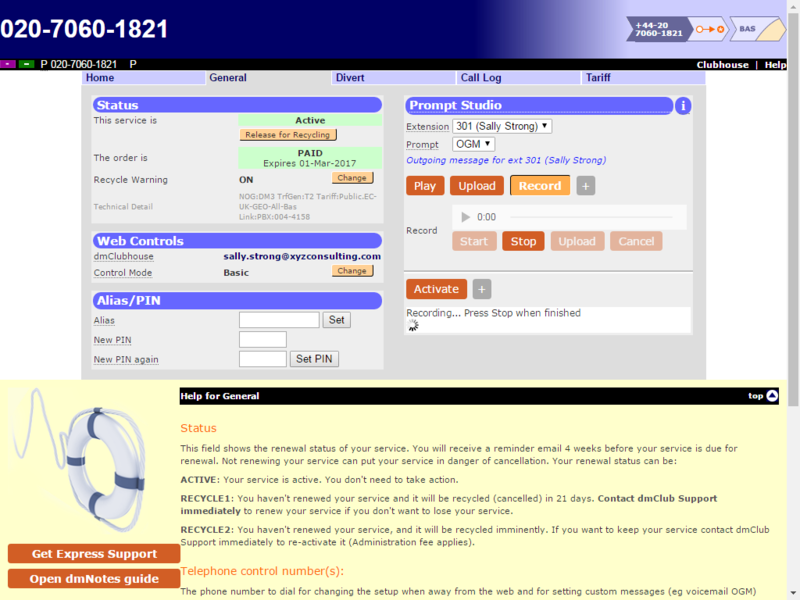 It can be found on the General tab of the Service Control. 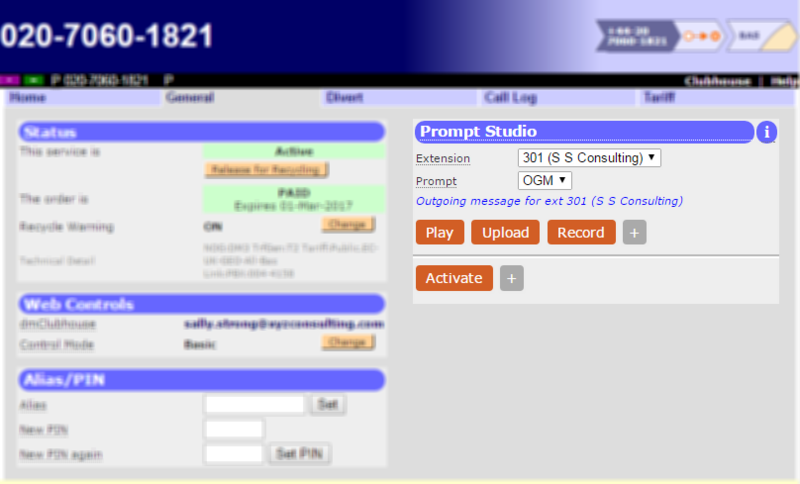 As dmConnect12 doesn't normally have any menus or announcements, the most common use of Prompt Studio is to set the Outgoing Message of the voicemail feature. This will be on extension 301. Press [Play] to hear the current message (if there is one). [Stop] to stop the recording. You can press to see how it is. If you felt it didn't go so well, Press [Start] and repeat, otherwise press [Save] or [Upload]. 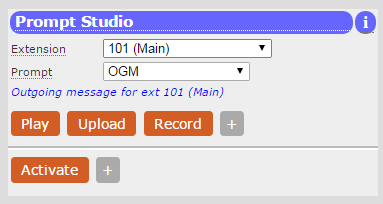 Note - The Prompt Studio will only let you upload/record prompts that are referenced in the currently active plan. So if you want an introduction prompt, you must make sure that your plan has an introduction prompt with some text script in it. With dmSwitchboard12, there can be quite a few prompts, so it can be useful to get a list of things to record. This is what we call the "Prompt Manifest". The Play buttons are shown where there's something to play - the Red ones are "Robot" recordings, and Green ones are uploaded recordings (or recordings made using the telephone-based Prompt Recording Studio). You can click the Play buttons to listen. 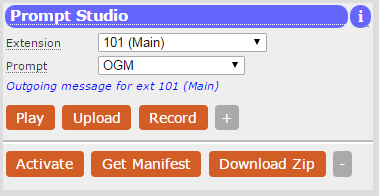 Armed with a copy of the Prompt Manifest, you can quickly go through all the extensions and all the prompts within the extensions (including OGMs) and upload files or record new versions as with the dmConnect12 instructions. Q: What happens when I change my plan? A: If it's a minor change, such as a change of divert destination, or changing the voicemail timeout, then no changes are necessary. 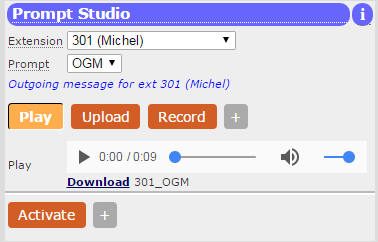 Obviously if (on dmSwitchboard12) you decide that extension 301 is now Fred Smith, then you might need to re-record OGM and any announcements. 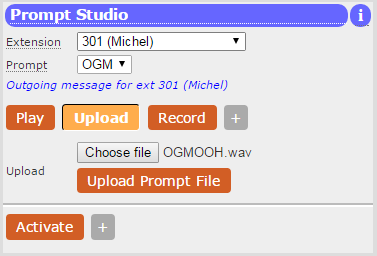 A major change of reception options, teams and staff will likely mean re-recording most of the prompts. Q: What if I don't like my recording after I've uploaded it? A: Unfortunately you can't roll back to a previously uploaded version (unless you'd had the sense to download and store the Zip) but you can revert to the "Robot" voice that our system generated from the script in your plan. You can do this on a prompt-by-prompt basis by pressing the [+] next to Record and then the [Revert] button. Q: Can I do this on an iPad/iPhone? A: Not yet, as neither of these devices allow html5 access to the microphone.